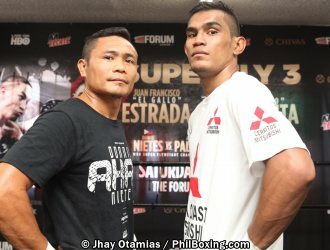 CEBU – The WBO has ordered the camps of WBO supefly champion Donnie Nietes and mandatory challenger Aston Palicte to negotiate and reach an agreement for the rematch within 15 otherwise the boxing body will order a purse bid. A minimum bid of $100,000 is required if the fight goes to purse bidding. Nietes and Palicte fought last Sep. 8 for the vacant WBO superfly belt that ended in a controversial draw. The WBO allowed Nietes to fight for the title again against Japan's Kazuto last Dec. 31 and also ordered Palicte to face title contender Jose Martinez of Mexico on Jan. 31 with the winners of both contests facing each other. Nietes went on to defeat Ioka in Macau by majority decision while Palicte stopped Martinez in the 2nd round in California. The Nietes camp, convinced that they won against Palicte the first time and cold on the idea of fighting another Filipino for the world title, is not very much interested to face Palicte again and is looking to fight bigger names like Thai star WBC superfly champion Srisaket Sor Rungvisai or Juan Franciso Estrada. However, Rungvisai, who has recently been signed by promoter Eddie Hearn of the UK, is scheduled to fight Estrada in a rematch on April 6. Hearn has offered Nietes to face WBA superfly champion Khalid Yafai on the co-feature but Aldeguer rejected the offer saying the date is too close. “Donnie has been fighting two world title fights in the last four months. April 6 is too close for him. He deserves some rest,” Aldeguer told Philboxing earlier. After receiving the WBO order this morning, Aldeguer is on a bind and needs to make a decision on what is the best move for Nietes. “We have to come up with a solution in 15 days,” Aldeguer said. “The priority is for Donnie to get the biggest fights out there. He wants to fight the winner of Rungvisai-Estrada or a unification with WBA champ Khalid Yafai. If he had a choice, he doesn't want to fight another Filipino again,” Aldeguer continued. Aldeguer however admitted that the Palicte rematch is still on the table if they could not find another avenue for Nietes. “We will know in the next few days as we have to find solutions with the consideration of Palicte still,” Aldeguer said.